My parents showed me pictures of Christmas one year when I was about 3or 4 years old. I must have been very good that year judging by the toys that were strewn all over the floor! I was having the time of my life that day but not with all of those cute little toys that Santa had brought. No, it was just me and a cardboard box! I asked my dad “where did that big box come from?” It just so happened that Santa had seen fit to bring a new refrigerator for the older kids that year as well. Why not give your child (or grandchildren) a gift they will always remember too? This is a simple home project that you can do together with the kiddies and it will give them something to be proud of when it’s complete. It can be as simple or complex as you decide and it costs almost nothing. First step is to find a large cardboard box. A refrigerator box is probably big enough but the bigger the better I say! Maybe a visit to a local appliance store or furniture retailer is a good start? I’m sure they’ll be willing to help out, especially when you explain to them what you need it for. Next you can use a knife or scissors to cut out the door(s) and Window(s). If you want them to open and close like the real thing just leave one side of the door uncut and you can split the window(s) down the middle to open outward from the center - very easy to do. As an added touch you could paint the outside of the playhouse to make it look more real. If your child has a favorite color that would be the perfect choice. Your imagination is the only limit here. Flowers, designs or just a simple color will make it that much more special. You could also paint the door a different color, add “trim” around the windows and even a door knob if you like! The inside could have pictures painted on the walls, kitchen appliances, a TV and so on. The amount of detail is completely up to you. No need to overdo it but you get the idea! As a final touch you could place some of the kids play furniture in the house such as a table and chair or even some cushions. If you don’t have any of these items a few pillows should do just fine. Now you have created something that you will never forget; something that they will never forget either. 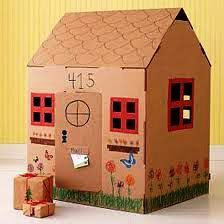 Every child deserves to have their very own “year of the box”.